by Brian Sloan. Oxford: Hart Publishing, 2013. 260pp. Cloth $132. ISBN: 9781849462815. Adobe PDF ebook $97. ISBN 9781782250463. Reviewed by Peter Cane, Australian National University College of Law, Canberra, Australia. Email: peter.cane [at ]anu.edu.au. At first sight, INFORMAL CARERS AND PRIVATE LAW is not an obvious subject for review in the LAW AND POLITICS BOOK REVIEW. The book is not well described as being about ‘legal process and politics’. I also doubt that there are many courses available in British law schools for which this would be an appropriate text, although there may be more such courses in the US focusing, for instance, on elder law or disability law. To the extent that carers, as such, receive attention in English legal curricula, this is most likely in courses on social security law, of which there are relatively few. I hasten to add that these observations are not intended in any way at all to be critical of the author. The book was written for a particular audience and it will serve that audience extremely well. The challenge presented to me by the editor’s invitation to review was to say something about this book that would be of interest to the very different audience of readers of the LPBR. Because INFORMAL CARERS AND PRIVATE LAW is primarily about English law, because it is an exercise in ‘internal’ legal analysis, and because my legal expertise is not in the areas of law with which the book deals, I decided that for readers who approach law from a social-scientific perspective and have no direct interest in English private law, an ‘external’ perspective might be more helpful and interesting than substantive engagement with the substance of the author’s analysis and recommendations. Before moving to that external discussion, I will briefly describe the context and contents of INFORMAL CARERS AND PRIVATE LAW. Publicly-funded benefits for carers of the old, sick and disabled are an established feature of the British social security system. This important and innovative book, by contrast, primarily explores the actual and possible roles of private law in providing financial support for carers by the transfer of resources from care recipients to carers. The contexts, of course, are the ageing of the population and public fiscal austerity. Besides bracketing public provision for carers, INFORMAL CARERS AND PRIVATE LAW is also limited to situations in which there is no contract between the carer and the care recipient for provision of care and remuneration of the carer. Several distinctions underpin the analysis. One is between rules and remedies that address issues of process on the one hand and issues of outcome on the other. For instance, a claim based on reasonable reliance by a carer on an informal promise by the care recipient to reward the carer with some benefit that does not subsequently materialise, would raise process issues. By contrast, a claim by the carer for the reasonable value of the care provided would raise outcome issues. Another distinction is between different possible bases of outcome [*35] claims: for instance, the carer’s need for financial support, compensation for financial loss suffered as a result of providing support, and the reasonable value of the care provided. A third important distinction is between common law and statute as the vehicle for creating the carers’ entitlements. Fourthly, Sloan distinguishes between carers who are in an intimate or familial relationship with the care recipient and what he calls ‘pure’ carers, who are in no such relationship. The core chapters of the book deal respectively with the common law of proprietary estoppel (Chapter 2); a New Zealand statutory regime for the enforcement of testamentary promises in favour of carers (Chapter 3); the common law of unjust enrichment (Chapter 4); statutory (‘family provision’) regimes that allow support to be provided for certain parties out of a deceased’s estate despite lack of provision for those parties in the terms of the will (Chapter 5); and statutory regimes that allow inter vivos property settlements on the breakdown of certain relationships (Chapter 6). Chapter 7 deals with rules that would allow reversal of a transfer of property from a care recipient to a carer. This last chapter links with other chapters of the book (Chapters 2-4) that deal with process-based claims, the difference being that those earlier chapters are concerned with possible transfer of resources from the care recipient to the carer whereas the last chapter is concerned with the transfer of resources back from the carer to the care recipient or their estate. Chapters 5 and 6 address issues of outcome rather than process. Sloan’s normative preference is that English private law should be more accommodating than it is to claims by carers, particularly pure carers. His main proposal is for the enactment of a statutory scheme dealing specifically with carers and analogous to the New Zealand regime discussed in Chapter 3. However, Sloan expressly brackets the larger social and political issue of the appropriate relationship between public and private provision for carers. Generally, the book is characterised by great analytical care, and a balanced and even-handed approach to normative issues. Shifting now to an external perspective, we may first note the socio-political context of INFORMAL CARERS AND PRIVATE LAW, namely an extensive, well-entrenched and relatively very-generous social security welfare system. The novelty of Sloan’s approach for the English reader, and others from systems that make similar public provision for carers, is precisely that it brackets social security and deals only with private law. For US readers, by contrast, the idea that private law might play a significant part in this area may seem much less surprising than Sloan’s implicit assumption that the state is appropriately the carer’s first line of recourse. For them, the book may provide a window onto a very different world and an unfamiliar way of thinking about the relationship between public law and private law, the state and the individual. Secondly, Sloan’s approach is based on a particular view of the nature of private law and of the role of courts in the system of government. 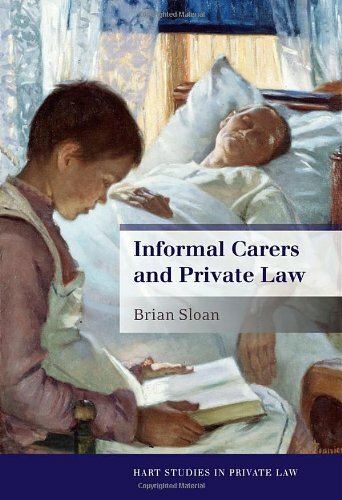 Although one of Sloan’s central concerns is the extent to which private law does and might accommodate the interests of carers, his [*36] approach to the law is doctrinal rather than functional. By this I mean that he thinks of private law primarily as an authoritative body of norms, not a tool of social policy. This approach is consistent with a view that the main function of courts is not to make policy but to resolve disputes according to law. By contrast, in the US courts tend to be viewed as active policymakers; and law, including judge-made private law, is commonly understood as an instrument of political power. This helps to explain why US political scientists are much more interested in courts than their counterparts in other developed English-speaking countries. Once again, INFORMAL CARERS AND PRIVATE LAW may provide interesting and useful material for thinking about the variety of understandings of law and the role of courts in different systems. There is a third, related point. As has been noted, Sloan’s preference is for a statutory regime designed specifically for carers to replace the current hotch-potch of private-law rules and techniques, none of which was designed with carers in mind. This preference reflects the nature of the system of government in England and the other countries to which Sloan refers. They are all systems of responsible government in which executive and legislative power is concentrated and in which, as a result, governments have the capacity to enact radical reform of the law relatively easily. By contrast, as a result of the diffusion of power in the US system and, in particular, the sharing of legislative power between the legislature and the executive, coupled with relatively weak political parties and party discipline within the legislature, it is much more difficult for large scale socially radical legislation to be enacted within a feasible timescale. In the US, courts may often seem to offer better prospects for legal change than legislatures. Here too, US readers interested in the subject matter of INFORMAL CARERS AND PRIVATE LAW in particular, or in the politics of social reform more generally, may find valuable comparative insights. Fourthly, from an external perspective Sloan’s book is exemplary of a style of legal scholarship that is much less highly valued in the US legal academy – at least at the top end – than in other common law systems. Sloan’s analysis presents a complex and subtle mix of descriptive analysis and normative recommendation. His approach is doctrinal in its conceptualization and acceptance of law as a set of authoritative norms. On the other hand, it is pragmatic in its exploration of the extent to which the current law accommodates and promotes the interests of carers, and its recognition of – indeed its emphasis on – indeterminacy in the law as a resource to be exploited as much as a disadvantage to be regretted. This marks a significant difference between the US and English versions of critical legal theory. US scholars in the critical tradition typically interpret legal indeterminacy as undermining law’s claim to separation from politics. By contrast, English scholars in this tradition often treat indeterminacy as an opportunity for promoting desirable social goals and correcting distributive injustices. Sloan’s advocacy for carers is gentle but firm and committed, and he seems to have considerable faith in the possibility of using private law to promote their interests. Fifthly, Sloan’s approach illustrates [*37] another feature of much non-US private law scholarship, namely a tendency to blur the line between description and prescription. Such blurring is characteristic of the common law judicial method that justifies decisions by a mixture of authority-based and value-based reasons. Because judges have authority, they are permitted to give effect to their own value judgments without being required to back them up with systematic or rigorous normative argumentation. As a result, judges often slip back and forth between authority-based arguments and value-based arguments without comment or concern. Many legal scholars adopt similar discursive strategies even though their work does not have the authoritative status that attaches to judicial pronouncements. As a result, scholars often make normative assertions or recommendations without providing much by way of supporting argumentation. This way of proceeding reflects a particular understanding of the relationship between scholars and judges according to which an important role of scholars is to assist the judges and courts in developing the law. In turn, this understanding may be rooted in a tendency to associate law with morality rather than politics, right rather than power. At the most abstract level, the main point of these observations, regardless of whether or not they are valid or plausible, is to suggest that secondary legal texts such as INFORMAL CARERS AND PRIVATE LAW can be read at various levels and in various ways. I hope to have shown in this review how a book that presents itself as a study of the doctrinal intricacies of various parts of English private law can be fruitfully read for what it can tell us about the relationship between legal scholarship and its social, political and constitutional environments. Assessed as a study of English private law, this is a fine, path-breaking book that poses questions and raises issues that deserve close attention and will, in years to come, undoubtedly assume ever greater social and political significance. Read as exemplary of a particular genre of legal scholarship, it may encourage readers to think comparatively about styles of legal scholarship and their roots in the legal systems in which they grow. It may also encourage sociologically-inclined scholars interested in ‘legal process and politics’ and ‘law and courts’ to undertake comparative explorations of the relationships between systems of government, law reform and legal scholarship. In many respects, US legal scholarship, both in public law and private law, is very different from legal scholarship in other common law countries. Explaining such differences may require us to think very deeply not only about legal process and politics, law and courts, but also about the institutional and constitutional dynamics of different systems of law and government. In addition to its value as a fine exposition of English private law, INFORMAL CARERS AND PRIVATE LAW may act as a catalyst for such deeper explorations of legal culture. Copyright 2013 by the Author, Peter Cane.